This is (the first of perhaps a few) blog post(s) where I will be thinking about aspects of teaching and practicing Ashtanga Yoga and Mysore. Since relocating to Denmark in autumn 2017 I have been lucky to be offered to teach a number of new yoga classes. Recently this has included Mysore classes and teaching this particular practice (and having conversations with students there) has prompted me to come back to writing blog posts about yoga. Do we perceive someone in the Ashtanga Yoga practice doing third series as ‘better at yoga’ than someone in the beginning of primary series? And if so, to what extend does the progression of the series of Ashtanga Yoga contribute to a (potentially) hierarchical notion of the practice? What affect has the #MeToo campaign had on our relationship with teachers/gurus? What do we mean when we use these terms? What do we expect from them? (In light of the point above) What is my position as a teacher? How do I deal with my own ambivalence of – on one hand – wanting to be indispensable in the teaching space and having authority and – on the other hand – being more interested in facilitating a safe space for practitioners to ‘work things out’ and to cultivate process and playfulness? What are (verbal and physical) adjustments for and what do they mean for the student/teacher relationship? I want to try to articulate what I feel is an essential aspect of the teacher role: to acknowledge that in the teaching space my position is as part of an ecology of people practicing yoga. Being a teacher of yoga and giving adjustments in not simply a question of ‘being better at yoga’ or ‘knowing it all’ and then passing it on. The practice of adjusting is a feedback system between students and myself where I am not an authority with all the ‘right’ answers. In this next section I want to think about what it means to ‘figure out what is right in the moment’ of teaching yoga when I give physical or verbal feedback to a student. The ‘figuring out what is right’ is a dynamic process of listening and responding where the touch which occurs in a hands-on adjustment brings awareness to the area of contact. The touch is delivered in a way (although resolute and clear) where it listens and responds to the student’s reaction. Rather than being an instruction that has a goal orientated one-directional push/pull the direction is negotiated in the interaction between the practitioner and the facilitator. Similarly, verbal instruction are an invitation for the student to feel, see or experience the body in a new way by directing her attention to an area of the body by using a language that opens the experience. This might be using words suggestively by saying ‘imagine your fingertips lengthening towards the sky’ rather than commanding ‘stretch your arm’, the latter prompting a fixed outcome and not a dynamic movement. Both types of feedback (physical and verbal) are means to assist the student in figuring out how to understand the body in the posture, how to deepen/relieve it and perhaps even resolve injury/pain. The new experience of the body or embodied understanding that the student achieves happens in the relationship between student and teacher as a result of the way the touch and/or instruction is delivered and received. In this way the student/teacher relationship moves away from ‘the teacher always knows what’s right/good for me’ to become a more organic process. What is interesting in this for me as a teacher, is that this process allows the student to experience agency in her own body/practice and it gives her an opportunity to reflect on the instruction/adjustment and accept or disregard it. As a teacher, I can step down from the pedestal of ‘knowing everything’. The dynamic relationship where knowledge and experience bounces between student and teacher opens up for the practice itself to come into focus, as the teacher. What becomes clearer to me as I practice and teach yoga (and other somatic practices in dance) is that this ‘ecology’ or ‘feedback system’ – where the emphasises is on teacher/student relations and interdependence and less on individual achievements – frees me as a teacher from an expectation to (re)solve the postural challenge and to do/say ‘the right thing’. One particular moment that this is palpable for me is when during a Mysore session I find myself with nothing to do. Nobody needs me to help them cross their legs in Supta Kurmasana or support them in Utthita Hasta Padanghustasana! Everyone is getting on with the postures and I feel like I have become spare. In that moment my teaching practice is not to make myself indispensable by rushing around to assist unnecessarily but instead acknowledge the importance of being a physical presence that holds the space. A presence that provides a boundary for the student’s practice even if all it means, is that she feels seen. As the content and title of this post implies I'm not interested in having all the answers but I hope that the post will generate discussions. Please feel invited to comment and give feedback to further illuminate the subject(s). ​I went through pregnancy and became a mother over the course of my MA Creative Practice degree, an experience that encouraged me to think about the meaning and character of training. This experience led to the Motherhood In/As Training film project as I wanted to explore the tension I felt between developing my creative practice and being a mother of a young child. In my first two films of the project – I don’t want to dance and 1, 2, 3… 4 ­– ‘training’ was conceived in opposition to ‘motherhood’. I began the project feeling there was a dichotomy between the two states: my training in dance required a physical body-mind dedicated solely to the creative work but motherhood meant that time and space were not exclusively at my own disposal. This was expressed in different ways in the two films, posted in May and July 2017. In the first film, I don’t want to dance, training was disrupted by the obligations and demands of motherhood, as my daughter, Lisa, pushed her way into the centre of my film. For the second film, 1, 2, 3… 4,motherhood challenged the temporality of training, as the film considered the notion that training is ‘for the future’ where motherhood is ‘for now’. Im right there and you're there from Marie Andersen on Vimeo. 1,2,3 ...4 from Marie Andersen on Vimeo. I initially thought the footage in 3 might work on its own for this blog entry, to link to and follow up the previous film and post, which has Lisa at the centre of the film. The rediscovery of the NSCD material changed my mind: I seemed to me the old footage had relevance to my theme. Once I managed to get hold of the ID recording the composition of the studio training film started to crystallise. 1)The ballet and contemporary classes in the NSCD footage are a good example of the development of technical skills seen as essential to becoming a proficient dancer. 2)With regard to the ID footage: technical dance skills were a prerequisite for the MA Creative Practice, which took these for granted, so that study could focus not on technique but on the develop of artistic ideas. The footage does not directly show the process of acquiring artistic skill, but nevertheless gives an insight into an early stage of the creative development of material. 3)Dancing and playing with Lisa felt like stepping out of training. We played without a specific outcome in mind and came closer to being equals as we took turns to lead play and generate ideas. ‘Being in training’ with a child does not work like formal training. Lisa does not enter a game or play with the intention of ‘getting somewhere’: she simply ‘does’. Momentarily I had the experience that our mother/daughter relationship was suspended and that our usual roles were put on hold. When I look back at this footage I watch myself go along with Lisa’s play and encourage messiness in the studio to a greater extent than I would do at home. The mother/daughter relationship never really ceases, of course – as is evident in a moment in the film – but perhaps in the ‘neutral’ studio setting it was overlaid by another connection between us where we could be creative co-players. I dont want to dance from Marie Andersen on Vimeo. This is a blog post was originally written for the Theatre Dance and Performance Blog posted on the 8 May 2017.
everything in cinema is choreography! The name of the film is 'In becoming' and it is based on my experience of being pregnant. Read my previous post about the starting point for my film here. The choreography of ‘In becoming’ took on a more indirect appearance than I expected. My film became an investigation in how movement can be expressed in the interplay between camera, filmmaker and the editing process. The dance materialises when clips entwine and changes of colours or movement come together. For me, the dance in my film is the duet between the poetics of the filming process and the ambivalence of my pregnant body. Below you will find an excerpt from the accompanying essay I wrote for the piece. I have chosen a section that focusses on the obstructions I set for myself when I made the film. The 'obstructions' I refer to are a set of parameters that were there to help me eliminate ways of filming and editing the piece. The obstructions I made up were based on the idea that the film itself was to become a grotesque body: ambivalent, open and subject to change, a thing ‘in becoming’. I wanted this to come across primarily in the formal approach to filming rather than in the content. The tasks/restrictions were intended both to restrict and to release the ways that I would shot footage and the ways that I would edit it. My experience from the filming tasks Tom (my tutor) had given us, was that what felt like a long take where the camera was kept still was often a shorter clip than I expected. I would come away with shots that lasted 30-40 seconds. I therefore chose as one obstruction to do takes of minimum four minutes where the fixed camera focussed on one detail and movement only happened spontaneously within the frame. This obstruction derived from the part about the grotesque body that emphasises incompleteness and constant change. On the other hand I was interested in footage that showed something complete (an action from start to finish), so that I, in the editing process, could break it up and manipulate it in to being incomplete. In order for this to work for a short film it had to be a narrative/action that was fast. Three minutes seemed like an appropriate length. My association with the grotesque body in this case was the cycle of ‘birth’ and ‘death’ or beginning and end. With these parameters I set myself practical tasks for carrying out how to film, without imposing content on what to film. This still provided scope for spontaneity and intuition. I filmed on my iPad and a pocket digital camera, a Canon IXUS 110 IS, which meant I could work quite discreetly and film in reasonable quality without drawing too much attention to myself. It was important that the action in the shot was as un-staged as possible. From the footage I had shot in its entirety I was not allowed to show a clip in its full length. To give the audience a sense of ambivalence and change I wanted the rhythm of the cuts to be constantly changing between fast/slow images and short/long takes. Beginnings and endings of clips should weave in and out of each other and always be open to change. Acknowledging that my intention was to make the final piece a reflection of the process itself, it seems misguided or beside the point to ask myself whether the film was ‘successful’. The point, instead, was exactly that I did not anticipate or plan the outcome and therefore the film is a testament to what was happening in my life at this time. If I had to remake the film, circumstances would mean it would have a completely different outcome. I anticipated in my last post about yoga during pregnancy that I would be able to keep up some degree of an Ashtanga Yoga practice. My honest intention when I wrote it was to keep a record of how to modify the practice during my pregnancy and post it here. Well, things didn't quite work out that way! 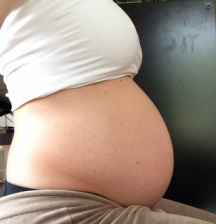 Although I have been fortunate to have a reasonably straightforward and uncomplicated pregnancy (I'm now entering week 30) keeping up the Ashtanga practice proved impossible. Most of my energy was channeled into teaching yoga and transporting myself between classes on my bicycle. When these tasks had been carried out, all I wanted to do was rest or sleep. Due to tiredness and some pain around my sacral iliac joint, getting up for early self-practice or even practicing a full Ashtanga sequence at home became too difficult. My practice in reality was reduced to a few stretches and meditation and on a good day a couple of modified Sun Salutations and some standing or seated postures. It has been challenging to let go of this expectation and desire to feel as fit and in control as I used to be. But pregnancy has uncovered aspects of myself I didn't know about and I have certainly had a lesson in letting go and accepting this constantly changing body. These pictures speak for themselves in order to explain how my body has changed. Over five months I have grown from being lean and athletic to being, well, something else! I'm sure that a rapid, involuntary and physical transformation like this happens almost exclusively on these occasions, when a woman is growing another human being. And I can honestly say that it makes me feel slightly grotesque. Grotesque in our contemporary understanding of the word, meaning comical, distorted and ugly, not so much. Mostly it makes me feel grotesque in what Bakhtin describes (see project brief below for explanation) as an existential experience of ambivalence and dualism; a celebration of the cycle of life. I feel removed from the sense of self that I know and at the same time fascinated by this novel experience of being a vessel for a new human being. Comments or observations are gratefully received on the brief below. What I have really enjoyed about the filmmaking process so far is that I’ve allowed myself to be intuitive. I had often experienced in the past that working creatively has been a path full of obstacles because I was trying too hard! I would overthink intentions and meanings and as a consequence the outcome felt contrived. The ability to let go of control and not to try so hard I’m convinced arises from my pregnancy. I have become a vessel for another human being and am no longer in complete control of my body. Having another human growing inside me makes me a stranger to my own body and an involuntary observer of a physical transformation. Hence, my world at the moment revolves around a kind of unruly body! This has turned my vision and my attention towards change and letting go. The underlying theme that resonates with me in Bakhtin’s quote is that of the body being in constant change. The celebration of the changing and grotesque body is a feature of the carnivalesque. If the classical body is all about appearance the grotesque body is all about experience. Bakhtin says earlier in his introduction: ‘Carnival was the true feast of time, the feast of becoming, change and renewal. It was hostile to all that was immortalized and completed’ (p. 10). The essence of the carnival was degradation and ‘bringing down to earth’ in order to make way for the new and fresh. The purpose was never to elevate or to complete, it was always, in a sense, ‘work in progress’. Giving in to the state of ‘constant change’ and accepting the course of nature is of particular relevance to me at the moment and so this will be the starting point for my investigation. Applying this to my final project for the Dance and the Moving Image module, the idea of change and the incomplete will be the pivotal point of my research. The grotesque body is not closed and complete but it is open to the outside world. Bakhtin says: ‘[…] the grotesque body is not separated from the rest of the world. It is not a closed, complete unit; it is unfinished, outgrows itself, transgresses its own limits’ (p. 26). That openness and susceptibility to change is what I hope to bring out of my work in the course of the next weeks. To clarify, the object of my research will not be that of the represented grotesque body (although this is not excluded); rather the film itself will be a grotesque body. Implicit in this is the idea of emphasizing process instead of outcome. This means thinking about how concepts such as openness and ambivalence can be introduced in the form (and not – or not only –in the content) of the work. In the context of my film this means that beginnings and endings can weave in and out of each other and that they are always open to change. Precisely like Bakhtin presents ‘ambivalence’ –something that is twofold, contradictory and ‘in becoming’. In this way the creation of the film will be the object of the final film itself. Since 2008 my main interest as a dancer has been improvisation and spontaneous movement. This means I have been more interested in the process and in learning as I go along, in relying on intuition. In my film, my starting point will therefore be to approach shooting with the idea of process to the fore. In this way I believe I can be open to the unexpected and be open to new pathways. In my experience with filming so far, I have found that when I work with material that comes from intuition and spontaneity the scenes seem to come together more easily and I engage a more creative part of myself. The pitfall here would be to shoot footage aimlessly and endlessly. I personally work best within parameters so the idea is to maintain spontaneity when filming but doing it within a framework of set tasks. Given my approach to the project I have not got any finished outcome in mind! However, in order to be true to the concept I have presented above I intend to set myself certain tasks as a strategy to collect and edit footage. The tasks will be based on the idea that the film itself is a grotesque body: ambivalent, open and subject to change. This will come across primarily in the formal approach to filming rather than in the content. The tasks (or ‘obstructions’) will both restrict and release the ways that I shoot footage and the ways that I edit it. Simple parameters will generate a complex system: the ‘product’ will be a record of this system rather than a finished object. Complexity is another feature of the grotesque. Like ambivalence, complexity indicates something that contains more than one thing at once, e.g. the pregnant body. To help this process along I will do some research into other artists’ work looking specifically for work that is done with the purpose of setting out obstructions or guidelines to generate material. An obvious one for me is fellow Dane Lars von Trier and his 5 Obstructions from 2003. I furthermore worked with a choreographer in Denmark, Palle Granhøj, who makes use of a technique developed for devising movement material, which he calls ‘Obstruction Technique’, which could also prove useful. And this is just to start off with. In order to collect material for the accompanying presentation and the piece of writing I will be handing in, I will keep a record of everything that seems of importance in the artists I research, the books I read, the encounters I have etc. Additionally I want to keep a diary where I either write, record or film myself talking about the different stages of the process. This will potentially be a part of the finalized project. In the spirit of the edited film, I predict that the presentation and essay will also be based on process, so this aspect of collecting material seems important. With the practical limitations that pregnancy entails it is easy to feel confined or inhibited when filming. The physical state of my body means that long hours of standing or walking to obtain footage is not available to me in the way it would have been before. Instead I have to find a way around it and make the restrictions a part of the process. My pregnancy itself is one of the obstructions! The experience of pregnancy is revealing things to me and it has a potency to it. I am hoping to make a film that will be a formal equivalent to the ambivalence of this grotesque body of mine! Mikhail Bakhtin, Rabelais and his World, Tr. Helene Iswolsky (Indiana University Press, 1984), p. 25-26. My boyfriend Alan has been working on the grotesque body in Italian comedies and he talks of the grotesque body as a body ‘in becoming’, a phrase I found useful to grasp the idea of the body in transformation, always somewhere on the scale between life and death.